Jamie Murray has called comments by fellow Briton Dan Evans about the doubles game “ill-informed and dumb”. Six-time Grand Slam winner Murray said on Friday that doubles success deserved more credit from British tennis. Evans has responded by saying doubles players were “people who didn’t make it at singles”. “To lazily trash the doubles game, it annoys me a lot,” said Murray, who is in the last eight of the men’s and mixed doubles at the Australian Open. Murray, 32, had said the Lawn Tennis Association (LTA), the governing body in Britain, “should not just focus on the health of the game based on singles”. 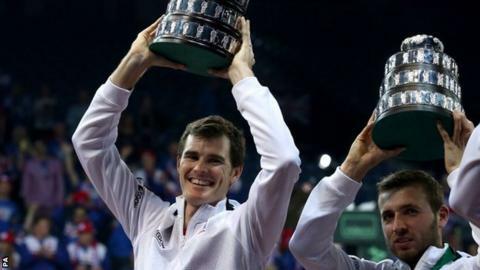 Seven British men are ranked inside the world’s top 60 doubles players – more than any other nation. But Evans, who lost to 20-time Grand Slam champion Roger Federer in the second round of the men’s singles at the Australian Open, told the Daily Mail: “So we are celebrating people who didn’t make it at singles and people who didn’t have the attitude to work hard enough to make it in the singles game? British number four Evans returned to the sport in April from a 12-month ban imposed for taking cocaine out of competition. He did not have a world ranking but the 28-year-old has since climbed back up to 189th. Speaking on Monday, Murray called Evans’ remarks “lazy”, adding that the suggestion players are on the doubles tour because they do not work as hard as singles players is “total nonsense”. He also described Evans as “someone who really hasn’t applied himself as much as he should”. “He has made a hash of his career with his decision-making and stuff,” said Murray. Murray’s coach Louis Cayer told BBC Sport that doubles players “are well supported, appreciated and recognised”. However, former world number one doubles player Murray has said he feels Cayer has been “under-utilised” by British tennis and suggested he should be the LTA’s high-performance director. Cayer has worked for the LTA for over 10 years and was recently appointed its performance advisor for the National Tennis Academy programme at Loughborough. “They ask me to help our best coaches, they ask me to be the performance advisor at the National Academy, and I’m still the doubles leader,” he added. Cayer also said he was “surprised” by Murray’s mother Judy – the former Great Britain Fed Cup captain who is his long-time friend and was ‘best man’ at his wedding – questioning whether the LTA’s plan to open two new academies was the right way forward for tennis in Britain. “When she had a group of Jamie, Andy [Murray], Jamie Baker, Elena Baltacha, she was helping them, travelling with them, providing a lot of competitive opportunities. They all became international players,” he said.